I am reading through Chapter Two of the recent European Economic Advisory Group (EEAG) report on the European Economy 2007. 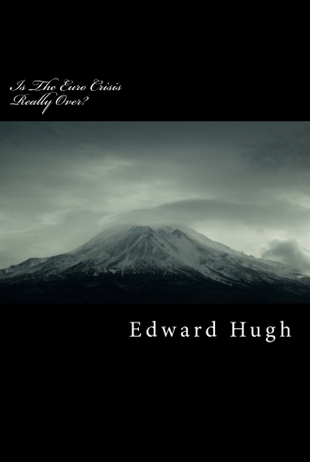 The chapter, which is entitled Macroeconomic adjustment in the Euro Area: the Cases of Ireland and Italy, asks a number of important questions and makes for interesting reading. The starting point for the chapter is a most pertinent question: six years after the introduction of the common currency, why do important differences in response to the application of a common monetary policy continue to exist across the eurozone? Indeed, on some readings, one might ask why these differences seem to be increasing rather than diminishing, or put another why, why do several significant eurozone economies appear to be diverging, rather than converging. To be sure some differential response among countries to the impact of asymmetric shocks was already anticipated at the outset, but it was always imagined that these differences would diminish and not increase with time. In the same way it was always anticipated that some sort of internal price convergence process would take place, but again this was always expected to settle down with time. Most recent evidence however continues to suggest that there are significant differences between zone economies in the way in which they respond to what is effectively one and the same monetary policy (even though its impact in real interest rate terms obviously differs between zone members as a function of differences in the underlying inflation rate, a fact which, in reality, only poses the same question at one remove, why should we see such a large spread in inflation rates continuing across time?) This conundrum is then the context in which the EEAG sets its comparison. At the outset of the report the EEAG spell out and make explicit an assumption on which most traditional analyses of adjustment processes within a monetary union have been based. "In a monetary union among countries with fully flexible prices and wages (and efficient financial markets), an asymmetric demand boom in a country would lead to an increase in the price and wage levels there, reflecting the relative scarcity of its domestic output." Now this assumption, whilst not being exactly false, does at least seem to be inadequate and in need of revision in the new global economic climate in which we live. One of the key reasons why this "old" approach now seems so questionable (at least in its crude formulation) is the fact that it does not seem to have taken into account the way in which the globalisation of labour and capital supplies may have changed things. The key issue here would be the underlying notion of "capacity" on which it is based, and the extent to which such traditional notions of capacity (and thus of "overheating") remain valid today. Globalization is an ecosystem in which economic potential is no longer defined or contained by political and geographic boundaries. Economic activity knows no bounds in a globalized economy. A globalized world is one where goods, services, financial capital,machinery, money, workers and ideas migrate to wherever they are most valued and can work together most efficiently,flexibly and securely. The language of Fedspeak is full of sacrosanct terms such as “output gap” and “capacity constraints” and “the natural rate of unemployment,” known by its successor acronym, “NAIRU,” the non-accelerating inflation rate of unemployment. Central bankers want GDP to run at no more than its theoretical limit, for exceeding that limit for long might stoke the fires of inflation. They do not wish to strain the economy’s capacity to produce. One key capacity factor is the labor pool. There is a shibboleth known as the Phillips curve, which posits that beyond a certain point too much employment ignites demand for greater pay, with eventual inflationary consequences for the entire economy. I cite Fisher at length here, since he does seem to be directly challenging the kind of assumption - as spelt out by the EEAG - which I am drawing attention to. As he goes on to say: "Until only recently, the econometric calculations of the various capacity constraints and gaps of the U.S. economy were based on assumptions of a world that exists no more". A world that exists no more. Please note. (A good summary of the kind of argumentation that lies behind Fisher's approach can be found in the central chapter of the Dallas Fed 2006 Annual Report - Globalizing the Knowledge Economy). Now, to qualify what I am saying a little, the issue is not that individual domestic economies are not subject to price and wage rises following surges in domestic demand, but that they are not subject to these to anything like the degree they used to be, and unless allowance for the extent of this change is made in the econometric models used, then traditional notions of "capacity" are likely to lead you well wide of the mark in looking at the impacts of monetary policy changes, since capacity itself has become much more elusive and elastic, and it is this very elasticity - ie the capacity for local economies to draw on large pools of underutilized labour, and over long distances, and avail themselves of the increased (and normally cheaper) supplies of capital which are available through global financial markets (and of course in the eurozone context the European capital markets themselves) - which means they are able to respond to rapid increases in demand without the normal wage and prices pressures coming into play to anything like the extent that they once did. In this post (which will be in three parts) I will follow the EEAG lead, and look at the two countries individually (Ireland and Italy), treating them to some extent as case studies to see what may be learnt (and a reflection on this will constitute the third part of the post). Firstly Ireland. "Ireland entered the euro area well into a sustained period of economic expansion marked by profound changes in the structure of the economy and its place in the global economy". This process has seen a rapid rise in per-capita incomes, and a dramatic fall in the level of unemployment. Interestingly this rapid economic development upswing coincided with a process known to economists as the demographic dividend, as I note in this post on "the Celtic tiger". A relatively loose monetary stance was motivated by the cyclical conditions in the euro area as a whole, but arguably inappropriate forIreland: It created undue demand pressures in the Irish economy. Now on the traditional account, the presence of such "undue" demand should have lead the Irish economy to "overheat", producing in its wake a growing inflationary wage price spiral., and indeed on conventional measures this was what was happening. But does this view correspond to the Irish reality? True the Irish economy has had noticeably higher inflation rates than the EU average in recent years, but this process has hardly spiraled out of control. 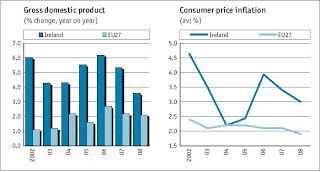 So - despite the fact that there has been a substantial rise in wage costs (from a very low level) if we allow for some measure of eurozone price and wage convergence over time, the general impact does not seem to have have been to force up prices and wages to such an extent that the Irish economy became uncompetitive. Curiously, if we look at the official Irish CPI, we will find that this actually trended down during the first years of the century, moving from an annual rate of 4.7% in 2002, to 3.5% in 2003, 2.2% in 2004, 2.4% in 2005, and only turning up again to 3.9% in 2006, a move which seems to have been associated with the fact that mortgage interest payments are included in the Irish CPI calculations. This hardly constitutes strong evidence of an inflation-push process fuelled by overheating, and especially not in view of the very rapid rates of GDP growth which Ireland was experiencing. So what happened? Well, in a nutshell, Ireland got immigration, bigtime, and the combination of this with a ready supply of cheap capital seems to have maintained Ireland on what might be considered to be a sustainable path. 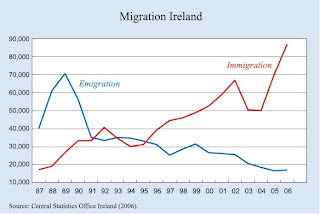 The general trend in migratory flows can be seen in the chart below, but as an indication it could be noted that in 2006, 86,900 people immigrated into Ireland, the equivalent of 2.1 percent of the Irish population and 4.1 percent of the labour force. Irelands labour force totalled 2,178,100 in the third quarter, a year-on-year increase of 4.4% or 92,000. This is extremely high by international standards the most recent EU-wide data relate to the second quarter of 2006 and put Irelands rate of labour-force expansion at 4.6%, almost four times the EU average of 1.2%. Immigration has been a crucial factor in this. Demographic change accounted for three-quarters (or 69,100) of the Irish labour forces growth in the year to the third quarter of 2006, and immigration accounted for 70% of this figure. The remaining, non-demographic increase in the labour force reflects continued increases in the participation rate, which rose from 63.2 to 64.1 between the third quarters of 2005 and 2006. So in part recent growth in the Irish economy has been facilitated by growth in the domestic availability of labour (whether through the arrival in the labour market of Ireland's still relatively numerous young cohorts - given Ireland's comparatively strong recent fertility levels - and through an increase in participation rates, both of these factors forming part of the underlying demographic dividend process) and via the arrival of migrant labour on a very large (indeed almost unprecedented) scale. In principle, a strong demand expansion should have created a severe labour shortage.But the booming economy stimulated a strong migratory inflow, with two major effects: first, the increasing supply of labour contained upward pressures on wages somewhat, especially in low-skill occupations.8 Second, the additional workers in the economy raised aggregate demand, reinforcing the expansionary macroeconomic stance for the economy as a whole. Since the availability of jobs acts as a strong driving force for migratory decisions, a sustained economic boom created incentives for further migration. "adjustment (to the monetary shock) seems to have worked as predicted by theory.... the....overall expansionary policy mix caused real appreciation, although adjustment through wages and labour costs was arguably contained because the strong migratory inflow reduced excess demand in the labour market. My feeling is that the whole classic account of monetary shock adjustment is rather more challenged by all of this that the EEAG seem to realise, but still. On the other hand the capital required to enable domestic output to expand so rapidly was readily available internationally, and at remarkably low rates of interest given the presence of the single size for all euro environment. Some evidence of the extent to which the Irish business sector - and indirectly Irish mortgage borrowers - have had access to global found in the graph below, where it can be seen that there has been a very rapid growth in foreign borrowing by Irish banks to finance domestic lending. 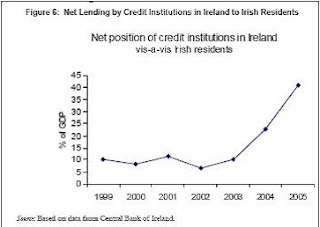 Since the end of the last century bank borrowing from abroad to on-lend to Irish residents has soared from 10% to 41% of GDP. Ok, so what I think is now clear is that if Ireland has had an unprecedented economic boom in recent years, it is in part because the "spare" capacity was available (elsewhere). But what about the growth itself. What were the structural drivers? Well first and foremost, domestic consumption (and the associated consumer indebtedness) has been a significant component. 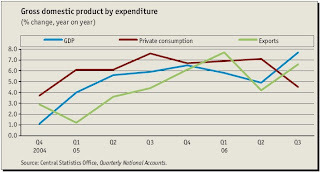 Private consumption has been growing strongly in recent years, but beginning in the third quarter of 2006 it has been easing back (showing a year-on-year increase of 4.5%, its lowest level since the final quarter of 2004), a sharp drop from the 7.1% recorded in the second quarter. "However, given that the increase in supply of new housing has been just as phenomenal, such rises appear unjustified by the fundamentals (the number of annual housing completions is almost five times that of the early 1990s. this compares with largely static output in the euro area and the UK)." Really I feel this type of response simply begs the question, whether or not this housing surge is justified by "fundamentals" is in part a question of determining just what these fundamentals really are, and about how well we are actually measuring them, not to mention how fluid they may have become, and whether they are not now something of a moving goalpost, at least in the Irish context. Now one of the most interesting things to note from the chart is that the largest spurt in price increases seems to have taken place in the 1997-99 period (ie before the official introduction of the euro, and before perhaps the more flexible supply of migrant labour and capital became available). A second (smaller) spike seems to have occurred after 2003, but it has not been anything like so dramatic. On the back of the most recent round of interest rate tightening from the ECB housing activity in Ireland has been slowing notably and indeed the average price paid for a house in Ireland in March 2007 was 2,007 euros less than the average price paid in February according to the latest edition of the permanent tsb /ESRI House Price Index. This is equivalent to a decline in national prices of 0.6% month on month. This is the first reduction in national house prices since January 2002, when prices declined by 0.9%. In the first quarter of 2007 (January to March) prices nationally decreased by 0.5% as compared with a growth of 3.5% in the same period of 2006. However on a year-on-year basis the average price pay for a house in Ireland was still 7.4% higher in March 2007 than the average price paid in March 2006. The big question is of course what happens next. This is not the place to enter a debate as to whether what has been happening in Ireland constitutes a bubble (I have some observations on the Indian property situation which are not without relevance here), or indeed of the extent to which such price growth as has occurred represents a distortion from "fundamentals", since this in large part depends on the extent to which fundamentals have changed, and this is precisely what we are still trying to determine. Evidently, with Irish consumers now the most indebted in the OECD, any sustained decline in property prices would make its presence felt via the well-known "wealth effect". But just how likely is such a significant "correction". In large part the "sustainability" of recent housing activity depends on the future course of interest rates at the ECB, and this is again beyond the scope of the present post, but suffice it to say that the current raising cycle may well peak (due to its impact on the larger economies like Germany and Italy with different structural characteristics to the Irish one) much sooner than many imagine - in the last quarter of 2007 or early 2008, and we may well then see another round of "easing", if so the associated fall in interest rates may well serve to place a platform under house prices in Ireland, and indeed the show (in perhaps a more modest form than hitherto) may well go on. Certainly there are no good reasons at this point to exclude this possibility. In addition it should be noted that Irish government finances have enjoyed a strong positive balance in recent years, and that any slowdown in the housing sector can - to some extent - be counteracted by the application of a countercyclical deficit. One indication that such an approach - in the eventuality that it may prove necessary - may not be far from government thinking may be found in the most recent National Development Plan. This is projected to cost 183.7bn euros over a seven-year period (2007-13). The NDP is aimed at tackling what are widely acknowledged to be serious infrastructure deficits. In addition - and for the first time in an Irish NDP - the package of measures includes current spending (86bn euros). This current spending, which will be focused chiefly on social expenditure, is dependent on tax revenue remaining buoyant (the governments plan is premised on average growth rates of 4%-4.5% over the period). As a percentage of GNP, capital spending will increase from 4.7% in 2006 to an average of 5.4% over the term of the seven-year plan. Finally, it would not be appropriate to leave this review without at least some comment on Ireland's external balance position. In the first place it should be noted that Ireland's current account is un-typical, in the sense that, while there is a small trade surplus, the current account balance is seriously in the red. This is largely due to the strong presence which FDI has had in Ireland over the last decade or so, and the strong consequent outward funds flow associated with the repatriation of profits (which has the further un-typical consequence that GDP is systematically lower than GNP. 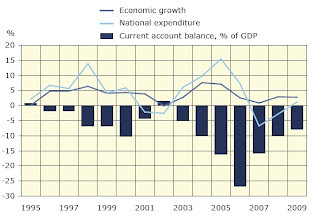 Evidently Irelands current-account deficit continues to widen. In the first nine months of 2006 a cumulative deficit of 5bn euros was recorded, a figure which was up sharply from the 3.9bn euros recorded a in the same period one year earlier. The third-quarter deficit totalled 1.2bn euros, an increase in 46% over the deficit in the same period of 2005. The increasing current-account deficit is largely a reflection of changes in the income balance, since the merchandise surplus was almost unchanged year on year at 7.6bn euros, while the services deficit actually decreased. However, this narrowing in the services deficit was more than offset by a widening of the income deficit from 5.4bn euros in the third quarter of 2005 to 6.8bn euros in the same period of 2006. This situation in part reflects an increase of 15.9% in profit outflows generated by foreign-owned business based in Ireland and of a 41.4% increase in portfolio investment income outflows. 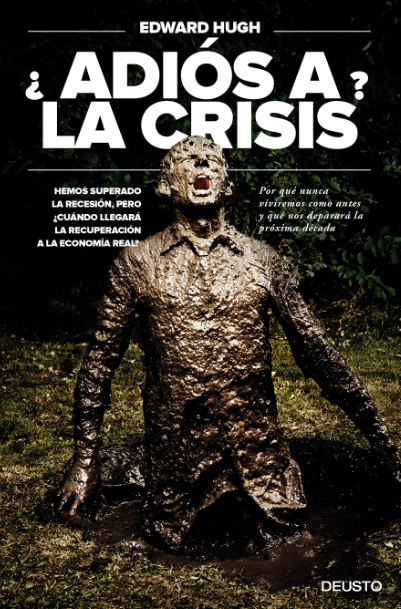 As with other deficit countries (Spain, the UK, the US) there is no doubting the existence of such "imbalances", the real issue is their significance. As Claus and I have been repeatedly pointing out (and here), if median ages to some extent govern the dynamics of domestic consumption, and some high median age societies (Germany and Japan, for example) are condemned to running current account surpluses if they wish to maintain growth, then logically others are condemned to run deficits. So, and summing up, what we seem to have in Ireland is a very interesting test case for the validity of the old versus the new models of capacity. On the face of it I would argue that global capital and labour flows have had a significant - and unexpected - impact on the path of the Irish economy, a development from which there is much to be learned. Let's just hope that over at the ECB they are listening. NB. 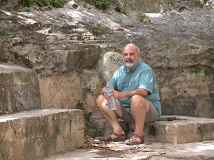 This post is the first installment of a much longer review post. More to come. Next stop Italy. 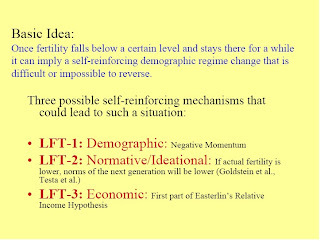 As Lutz says the key idea is that once fertility falls below a certain level (and even in the event that the hypothesis proved to be well founded this level could only be determined empirically, on the basis of actual experience) a self-reinforcing demographic regime may be established from which it is hard to escape, in the sense of raising fertility back up towards replacement levels. The cut-off point which Lutz et al start from is 1.5 (and in this they take their lead from a proposal by Peter Macdonald in this paper ). This figure does seem to have some coherence in terms of actual experience to date, since with the exception of Denmark - which did briefly fall under 1.5 tfr in the 1990s - no country seems to have gone below it and come back up again. As I said, the whole process is described in terms of three basic components (LFT1,LFT2 and LFT3 respectively). The first of these - the negative momentum component - does not, of course, affect fertility (in terms of the TFRs of those of childbearing age) directly, but it does affect the shape of the population pyramid, and in this way it affects the future shape of the pyramid by influencing reproductive cohort size and also may influence social attitudes to childbearing. There may also be an impact on the third mechanism, the economic one, as I shall try and argue below. As reported by the Federal Statistical Office on the occasion of Mothers Day on 13 May, about 1.9 million mothers in Germany aged 15 to 64 years raised young children of under three years in the household in 2005. That are about 154,000 mothers less than in April 1996. This is shown by current results of the microcensus, the largest household survey in Europe. In this context, children include not only natural children but also stepchildren, adopted children and foster children. The microcensus results also show that the number of mothers with young children in the former territory of the Federal Republic (excluding Berlin) was down by 225,000 from 1996 to 1.5 million in 2005, whereas in the new Länder (including Berlin) it rose by 71,000 to about 346,000 in 2005. The upshot of what they found in the census is that were 150,000 or so less mothers of children under three in 2005 than there were in 1996. That is a cohort width shrinkage of something like 5 - 6% in nine years, which I think is quite a lot. And of course with below replacement fertility on and on it goes. (The reasons for the apparent disparities between East and West would need further examination, although several possible explanations immediately spring to mind, including some rebound from the very dramatic collapse in East German fertility which took place after 1990. There may however also be changing cohort size elements from previous generations at work, as we all know demographic processes tend to cast a long shadow). 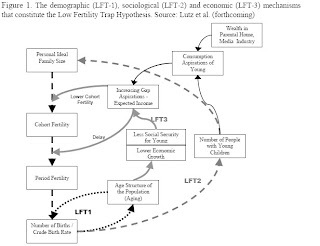 "The sociological mechanism of the Low Fertility Trap Hypothesis (LFT 2 in Figure 1), is that the assumed is that young people are socialized in a way that they internalize the family size norms which they experience around them in term of actual fertlity. This suggests that ideals will decline about one generation length after the decline in TFRs. This timing fits quite well to the German speaking countries which were the first to enter a steep fertility decline in the 1970s and which in the 2001 Eurobarometer are the first to show significantly lower personal family size ideals for the younger age groups." The change in attitudes to childlessness reveals yet one more mechanism whereby this decline in average desired family size may be working. What would be interesting would be to know more about why childlessness is becoming more socially acceptable, and why the effect is so strong in German speaking countries. "We study data on earnings by age, gender and education for full time workers over time. 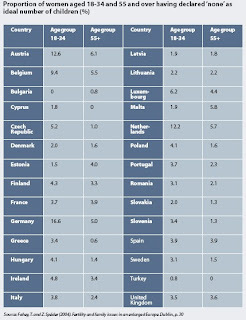 As can be seen by Figures 2 and 3, individuals aged 20-34 earn the least. The Figures also show that the young have profited less from the economic growth relative to the other age groups, and that in Canada they actually experienced a decrease in real wages (while other age groups had a rise) since 1981. In the UK women aged 20-34 had a positive, but relatively slow wage growth, where the 35-49 year have a 66% higher wage growth than those aged 20-34. The negative development of income for women in their peak-childbearing years may represent one reason why that fertility timing is postponed and fertility outcome is lowered." Now this data is interesting, and the situation revealed obviously forms part of the environment in which young people take their childbearing decisions, but perhaps from the point of view of the fertility trap hypothesis something is missing, since these changes do not, in and of themselves, seem to be produced by demographically induced processes and as such they may not be considered self-reinforcing. What might these changes be due to? Well, globalisation processes for one, and technological changes for another. When I say technological I am thinking of the so-called "changing skill bias of work" argument, which would seem to imply that in order to achieve the higher salaries which go with higher value added work young people need to acquire more education and relevant experience. This factor certainly may act as an incentive to delay having children. However, in line with the exogenous shock idea, the data Lutz et al seem to have studied is cross-country data regardless of Tfr, whilst what would really be needed to validate the economic mechanism Lutz et al advance as part of their trap-feedback hypothesis would be data which correlated earnings for young people (under say 30) with Tfrs, and showed that as the Tfr dropped below 1.5 this income effect became more pronounced (or vice-versa if you prefer). But in the final analysis the key point about both the globalisation and the technology arguments is that they are better seen as exogenous (ie external to the system) shocks, which have a "level effect" impact in terms of the timing of the first birth decision. For the fertility trap hypothesis to have internal coherence what we need are endogenous processes, ones which are internally driven by the model and repeat and repeat. Based on the work which Claus and I have been doing on the Life Cycle Model of consumption and savings in the context of rising median ages (see, for example, this post)I think we may well have come up with just some of these. Essentially the argument, as it is presented here, is that as median ages rise beyond a certain point - 42/43 let's say - the structural characteristics of the economy change. While younger economies - let's say with median ages in the 35 - 39 range - are driven by large scale borrowing (on aggregate), domestic consumption surges, and, of course imports and current account deficits to match the domestic savings weaknesses, the more elderly ones can exhibit higher relative savings levels (Japan, German, Italy, Finland, possibly Switzerland), can no longer rely on domestic consumption to anything like the same extent, and increasingly come to depend on export growth for GDP growth. 1) In order to compete for exports these economies have a permanent pressure on their tradeable sectors, whereby outsourcing is continuous and ongoing, wages are continuously compressed, and structural reform is permanent. Since the very export dependence is only further reinforced by the continuing process of change in the population pyramid (ie domestic demand never "recovers" as such) this is all self-reinforcing. That is the more time passes the more there is downward pressure on the wages of young people. 2) Due to the comparatively lacklustre economic growth performance there is a constant shortfall in the tax income necessary to guarantee existing welfare and pension commitments. This shortfall is produced by the low levels of trend growth (think Italy, Germany and Japan) which you can generate exclusively on the basis of export growth. Since the changing pyramid structure (here is another part of the feedback loop) means that an increasing part of the voting population comes to be over 50, the tendency, as we are in fact seeing, is to attempt to maintain welfare commitments by increasing the tax burden, which affects the consumption and earning possibilities of the young directly. 3) Migration factors. The general lack of growth in the economy, and the tendency towards increase retirement ages and higher participation rates at the older ages, all mean that there is a relative lack of well paying jobs at the entry level, a phenomenon which makes outward migration an increasingly attractive proposition for educated young people (again, as we are seeing in Germany and in Italy). This out-migration once more feeds back into the structural evolution of the population pyramid. If the out migration is in part compensated for by in-migration of lower skilled workers, then this tends to retard the process of moving towards higher value work, a feedback which one more time would seem to find reflection in lower wage levels on average in the younger age groups. 4) Impediments on pro-natal policies. The pressure on fiscal resources which result from the previous three factors mean that effectively it becomes increasingly difficult to generate the resources to finance really meaningful pro-natal policies which might attempt to "tease" fertility back up towards a higher level. As time goes by this problem only gets worse. OK, these are really simply a set of working notes. Comments, as always, welcome. Iceland's recent elections have already been covered by Manuel in the accompanying post , so here I will concentrate almost exclusively on the economic side of things. On the face of it Iceland is an unlikely place to have been at the centre of global economic attention. It seems hard to believe that a country of barely 300,000 inhabitants could, at one point, have been thought of as a potential trigger for a new version of the 1998 Asian crisis, or the broken thread which would unwind the ever-tensed carry trade, yet such possibilities were clearly being entertained. And now here we are one year later, the long feared emerging market debt crisis has certainly not materialized, and, of course, the carry trade is still very much alive and kicking. Furthermore, despite a substantial drop in the currency, a sharp hike in interest rates, and a loud screeching of the brakes from the GDP growth department, it would be unwise to consider prime minister Geir Haarde's claim that Iceland has weathered the storm and that the country would emerge from "this economic boom in a very stable way" (read soft landing) to be mere electoral spin, and indeed the Icelandic voters in increasing their support for his party certainly do not seem to have read it that way. 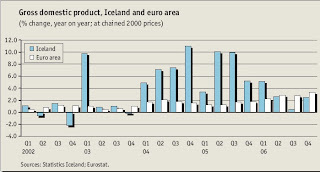 True Iceland's growth rate has suddenly ground to a near-halt, with growth this year being forecast to be a mere 0.9%, but with a current account-deficit at year's end 2006 running at 26% of GDP, and with a currency slide last year of some 30%, and with central bank interest rates currently running at 14.25% (see interest rate chart below) some sort of slow-down would seem to have been inevitable. The only surprising thing really is that it has not all been more serious. The root of the recent trouble has, of course, been a massive investment programme in aluminum smelters (details of the background to the aluminum smelter issue can be found on in this useful wikipedia entry). The smelter-welter was accompanied by a sharp surge in housing activity associated to some extent with reform and deregulation in the housing market and as well as with changes in the banking sector which lead to a more widespread availability of funding for house purchases. This increase was, naturally, then further fueled by the consumption boom which accompanied the "sizzling" growth produced in the general economy by the rise in investment and construction activity. Obviously the Iceland 2006 story was a matter of imbalances if ever there was one, but as we are learning there are imbalances and "imbalances", some are long term and structural in nature (eg the demographic ones, global capital flows) and others are of a shorter term nature, conjunctural, often the result of bad policy decisions, and thus, for this very reason, capable of redress. Fortunately Iceland's problems were of the latter kind, and although imbalances still evidently remain (and even could be rekindled if the ardour for rapid-order smelter building hasn't been damped by now), perhaps the worst is really over, at least for the time being, and certainly according to the latest report from the ministry of finance (watch out very big PDF) which argues that that the investments in aluminum smelters that skewed the economic numbers in the first place by boosting imports will come to an end this year and that these imports will now steadily be replaced by exports as production from the new plants comes online. Indeed according to the Icelandic government's own projections, total aluminum output in Iceland will rise by 68% this year and by 43% in 2008 (domestic aluminum production totaled 326,090 tonnes in 2006, an increase of 19% compared with 2005, while aluminum accounted for 23% of total goods export value last year, a rise of 5 percentage points on 2005). "with the stability of the krona increasingly dependent on the willingness of international investors and creditors to fund the deficit, the risk remains that any downturn in the global financial markets could lead to a sharp depreciation of the currency and a deterioration in the inflation outlook, particularly with a tight labour market posing the risk of a wage-price spiral." The income balance on Iceland's current account - which measures interest payments and income from crossborder investments - has been fairly volatile in recent years. This is in part a result of overseas investment by Icelandic companies. In fact the deficit on the income balance in 2006 (which represented one-third of the overall current-account deficit), was almost three times the figure for 2005. 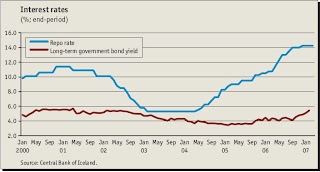 The bulk of the deterioration was the result of higher net interest payments (on account of rising foreign interest rates), together with an increase in dividends and reinvested earnings out of the country (as a result of foreign ownership of Icelandic corporates). Net financial inflows in 2006 also almost tripled over the 2005 figure. This was mainly a reflection of increased foreign borrowing by banks and corporates. Thus by the end of 2006 Iceland's international investment position was in deficit to the tune some120% of GDP which compared with a 'mere' 85% of GDP 12 months earlier. As a result total net external debt - which excludes direct and equity investment - was equivalent to 207% of GDP at the end of 2006, up from 154% of GDP in 2005. The increasing internationalisation of the economy and the high level of private-sector external debt imply that the financial sector will continue to be affected by foreign investors shifting risk appetite. However, Iceland's strong public finances and pension system, its high standard of living and a well-capitalised and increasingly diversified banking sector mean that a sovereign default or a banking system crisis are unlikely. At the end of the day the delicacy of the situation surely hangs on the future of the recent surge in aluminum prices - which have almost doubled since the end of 2003. So in part any assessment of the outlook for Iceland hangs on the view you take of outlook for global demand growth in the coming years. If you take the view - as I do - that growth in developing economies like China, India and Brazil etc will tend to maintain global demand growth at a typical levels in historical terms, then, smoothing out the odd bump here and there, the price of aluminum (like other commodities) should remain within tolerable levels for the Iceland project to be able to work, especially since their "alternative" energy background costs may prove to be more stable than those of producers who depend on more conventional energy sources. In spite of the recent disquiet in international financial markets, prospects for the world economy are generally favourable. World economic growth continues robust, close to 5 per cent this year and next, although this forecast has been slightly scaled down from earlier forecasts due to the outlook for slower growth in the United States. Growth in Japan and the euro area has been modest but stable, and indications are that it is improving. Growth in emerging market economies, especially China and India, will continue rapid. International trade expanded by 9 per cent last year, providing the engine power for growth in the international economy. In a nutshell, despite the question mark over the strength of domestic demand in Germany and Japan, as long as world trade expansion continues to chug along at something like the 9% rate recorded last year, then the Icelanders should eventually find themselves able to walk their way out of the woods. So while we may well see a drop in the pace of this expansion at some point as and when the developed economies enter recession, over the mid term horizon there is perhaps no need for alarm. Moving on to more general structural issues, Iceland, along with the other North European economies, has steadily moved from the traditional occupations of fishing and farming, through industrialization and onto the high road of becoming a services economy, producing in the wake of this process a services sector which today employs some 71% of the labour force. For the rest, 22% of the workforce are employed in industry, 4% in agriculture and 3% in the fishing. As others have noted, the drive towards a service economy in Iceland needs to be contextualized in terms of the very special value framework that permeates Icelandic social and political discourse, namely the presence of an acute sensitivity towards environmental issues, and towards the protection and conservation of natural resources. Whilst this approach has long been evident in sectors like fisheries and agriculture, such considerations have also played a significant part in the debate about industrialization, and have perhaps been an important impetus in the drive towards a services-based economy, which, at the end of the day, could be a lot less environmentally disruptive than an industrial one. In effect, the industrialization of Iceland has been to some considerable extent synonymous with the harnessing of domestically-based energy resources, like the hydro-electric and, more recently, the geothermal ones, which are energy sources which are seen as providing a more consensual base in political terms as well as being a more sustainable basis for economic development than fossil fuels, in particular due to the renewable nature of such energy sources. So Iceland is in transition, and the very pace of the change which is taking place there towards a high-tech economy specializing in areas like medical equipment, food processing and fisheries equipment, biotechnology and pharmaceuticals means that Iceland has to draw heavily on human resources, and it is precisely in this area that some longer term structural difficulties are raised. As is noted in Chapter II of this 2006 OECD document (Economic Policy Reforms: Going for Growth 2006) "while participation in tertiary education is high, the proportion of the working-age population with only lower-secondary education is still significant, even among young people", and this situation acts as a constraint on the transition to high value services. 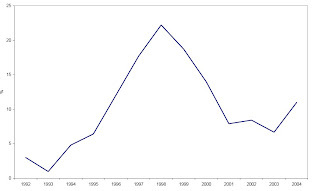 Despite the fact that Iceland's fertility is comparatively high (see below), the comparatively high rates of economic growth that Iceland has enjoyed have continued to put pressure on the available labour supply, a feature which is reflected in the very low unemployment rate, which was running at 2.9% in 2006 (a factor which undoubtedly help fuel the overheating situation). In fact Iceland continuously has one of the lowest unemployment rates and the highest labour force participation rate in the OECD. So to some extent horizontal economic growth in Iceland depends on immigration (Iceland has a current immigrant population of around 7% according to this source), while vertical growth (or movement up the value chain) would seem to depend on educational reform and improved human capital quality (which is obviously a process which needs time to lock-in). 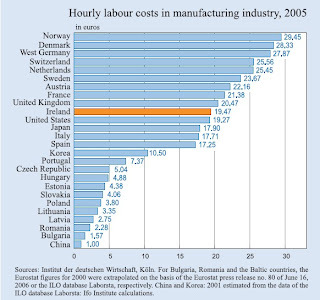 So clearly, if the competitive position of new, high technology industries and services is to be sustained, and the value added component is to be increased in this rapidly diversifying economy, further investment is required, and in particular so in view of the gap between the existing skills of the labour force and the needs of these new activities - a gap which is often commented on by outside observers (see this OECD document, Thematic Review of Tertiary Education) - Iceland really needs to work hard to try and improve the ratio between those with minimal and those with high skills. So, summing up, even if Iceland may be considered by some to be merely a "a tiny economy in the middle of the Atlantic", the long term position of this "tiny economy" would seem to be relatively sound, since the population structure - as I point out in this post here - is comparatively stable by OECD country standards (fertility is near to replacement level), and a judicious use of structural reform and immigration policy can maintain Iceland on a more or less stable path despite the comings and goings of smouldering smelters. So is this really so bad as it seems? Well let's revisit an argument Claus advances in his recent French post, which is that if some countries with high median ages are now structurally tied to dependence of exports for growth (and sustainability in their public finance), then logically other countries (with somewhat lower median ages) are going to need to run ongoing trade deficits. Claus was referring to France in its ongoing relationship with Germany, but the argument could easily be extended to Iceland and points further afield. Iceland still has a median age of around 34 years, which makes it a very young country in developed economy terms. 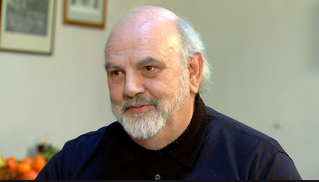 So if we can apply Modigliani's Life Cycle Hypothesis to populations in the case of the elderly economies (Japan, Germany, Italy, Finland etc), why shouldn't we apply the same notion to the relatively more juvenile economies, who can with some greater realism accumulate liabilities now which can be paid off later, as the population ages and domestic saving increases? I know this as all somewhat politically incorrect, but I do worry just exactly what would be the impact on overall economic welfare of all the younger median age societies bringing their economies into trade balance, since the level of ongoing global growth would obviously be lower, and I am not really convinced that this would be especially desireable as an end result. William Poole raises some of these questions in this speech here and he leads Mark Thoma to wonder whether such notions might not lead us to "become complacent about the potential for a sudden rebalancing of global accounts". All I can say in response to this is that I appreciate the concern, complacency is never a good thing, but at the same time I cannot hep feeling that if the weighting which people like Claus, William Poole and I give to demographics in the whole narrative account of the imbalances process is justified, then the kind of sudden correction which Mark so fears is unlikely, since the imbalances themselves correspond to a long term underlying process. Really I cannot help feeling that the biggest danger really lies in trying to conceptualise todays problems in terms of yesterday's theoretical framework, but then maybe that is just a case of me being me.